Winter is a sand artist. When I was growing up in NYC during the 1970’s, sand art was the rage. 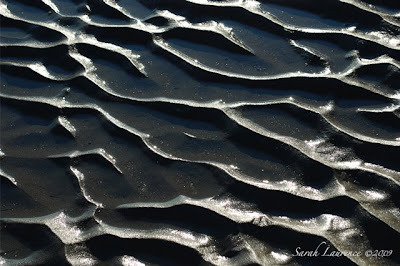 You’d pour layers of dyed sand into a glass jar and poke it with a toothpick to create waves of color in sunset ripples. 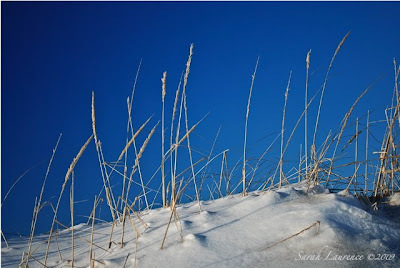 In Maine, snow and salt bleach the dunes. Arctic air dyes the sky deep blue. 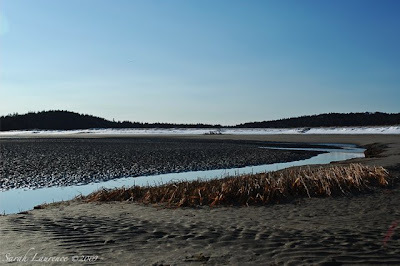 The wind and tide sculpt ripples across Popham Beach. Sand changes color from dry to wet to frozen. The scale is a matter of perception. Tides drag stones across a canvas to paint trees. Submerged, the beach is a mirror. The landscape is my museum. I’m a curator, a witness, a muse. Sigh...landlocked in Oxfordshire, I had completely forgotten about such riches. Now I need to feel wet sand between my toes. These pictures are a total joy. Again, it does look chilly but makes the city seem rather dreary. Appallingly dreary in fact. PG, if it makes you feel better: your bare toes would get frostbite on a Maine beach in winter. I’ve been missing Oxfordshire, especially spring daffs. It’s nice to be able to visit and share our bounty. Elizabeth, thank you. It’s another bright day if chilly. I’m taking the kids back to the beach today, but I’m sure they’d rather be in NYC, no matter what the weather. The bright lights of NYC compensate. I hope the sun shines for you later. 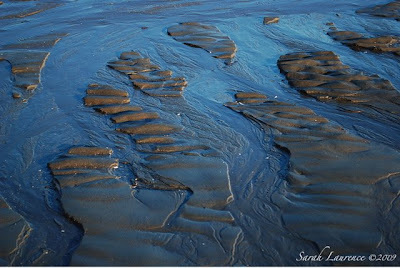 And an awesome photographer who paints quite a picture of sand art. Just beautiful. Last night the curator of Maine Botanical Gardens came and spoke at our plant society. It was so nice to have a piece of home for a bit. He was good too! He shared some pics, so yours along with his really makes me think of Maine. Tina, thank you! I must visit the Maine Botanical Gardens . . . once something is blooming, sigh. These pictures are gorgeous. I'm always amazed at how individual beaches look. A few summers ago, I was visiting beaches in N. Calif. They had a very different feel to them than our beaches here in So Calif. I love the ripples! Every photo is so beautiful, Sarah. I can see why Maine inspires you. Barrie, that’s a good point about beaches. 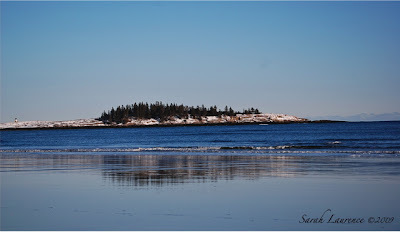 Even Popham looks different by season or tide. I’d love to see Californian beaches. Thanks, JAPRA, the ripples shot was one of my favorites too. I enjoy finding abstraction in landscapes. Hi Sarah, how wonderful. Your photos are amazing, showing well the art in the sand dunes and plants. The blue of the sky and water looks endless. I feel like I've been to an exhibit. What wonderful photographs! Frances, thank you. I look for the blues to break up the white of winter. Phillip, that’s the highest compliment. Thank you! 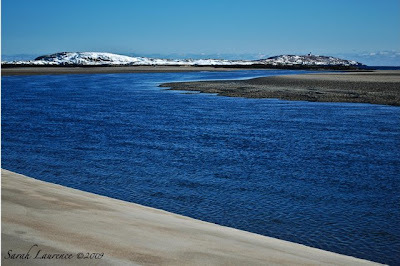 I love the photos - you have such a way of capturing what I love about Maine. I think the highest compliment I can pay is to tell you this: I love Wednesdays because I know you'll update your blog! Mary Ellen, that’s the best affirmation, coming from another Mainer. Your Wednesday comment makes me smile. I love my blog day for the time to reconnect with all of you here and on your blogs too. Thank you! Oh my! What a gorgeous set of pictures. I need to think about traveling to winter beacher instead of just summer. Troutbirder, I prefer beaches in winter because you have the space to yourself. It’s a welcome respite from slipping on ice and snow. The light is better too. In Maine the water doesn't get warm enough in the summer so you might as well come off season. You are truly a fortunate soul. Living by a winter sea must be pure bliss every single day. Thanks so much for sharing! Beautiful pictures, Sarah. 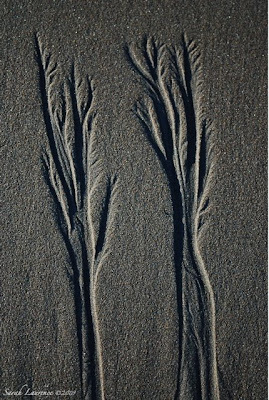 The trees drawn in the sand struck me particularly, but all of them had so much to offer by way of inspiration and just sheer pleasure. Thanks for posting them. I'm going to return, over and over again to absorb the beauty in these natural, raw photographs. Sarah, I thought I was reading the beginning of one of your novels. You really drew me into the scene with your words, and the pictures were an added delight. Pamela, I live in town, 2 miles from the water. It’s a half an hour drive to the beaches. I do enjoy being close enough to the sea to visit, but I don’t have time to go every day. I often walk along the shore on weekends. I can’t complain! Dave, the tree images totally captivated me, especially how they were made. 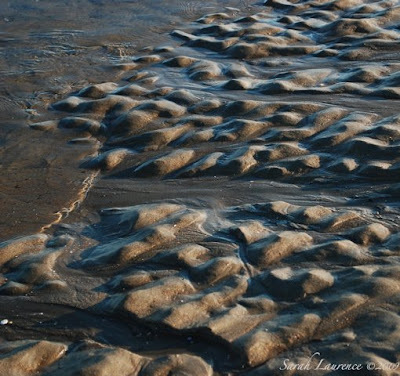 The sand at Popham is very fine and hard packed. Stationary pebbles on the beach funnel the sand into those lines as the surf washes in and out. What I love about photography is how it makes me stop and look at things more closely. What I love about blogging is being able to share these small wonders with people like you. Mama Shuja, I love knowing that you are coming back to visit. I love visiting your blog too. These connections we make through blogging are so special. Thank you! W2W, what an interesting observation. 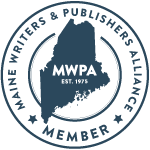 There is a parallel: first lines in a blog or a novel need to hook a reader and draw them into the narrative. That’s a point easy to forget when writing something as long as a book. Blogging, with its instant feedback and constant new starts, is teaching me an important lesson. Thank you, teacher! Those pictures are fascinating! I'm rarely near a beach in winter, so I like seeing the changes that winter brings to the sand and surroundings of beaches in your beautiful photos. Donna, thank you! Today the beach must be covered in snow. Yet another storm. Alyson, it was amazing how the surf on a pebble could create that tree shape. It reminded me of The Little Prince. Magical! You're a curator, a witness, a muse and a POET (spare words/spare images). I could see this as a children's book..."Winter is a sand artist." Thanks for taking me to the beach. Just back from a camp near Katahdin, so quiet (fortunately not yet stormy). Sarah, these photos are so beautiful--it's obvious they were taken by someone with an artist's eye. I'm sure it must be cold on that beach right now, but your photos make it look so inviting. Thanks, Charlotte! Hmm, maybe it could lead to a children’s book. Interesting idea. I want to hear all about Katahdin. Rose, it is cold but still inviting. Thanks! This was one of the loveliest of posts. Cynthia, thank you! Photography is an art, but it feels like I’m copying from the master. The landscape itself is so stunning. Jan, that is so sweet of you. Do blog more; I enjoy your posts too. What a soul satisfying post (and day, no doubt). Ms. Wis, thank you; it was. What Elizabeth said -- "joy" and "beautifully observed" capture it perfectly. The "trees" in the sand are the really stand-out image for me. Bee, thank you. The "trees" were my favorite too – discovering them in the surf was such a joy. 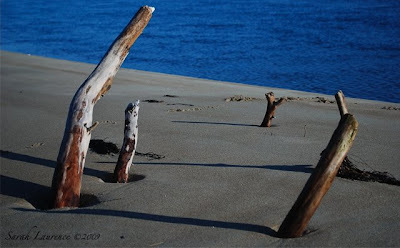 They are washed away now but caught forever in my blog. ACIL, amazingly enough those blues are true. The sky is even bluer today. It’s the cold air that does it. Welcome to my blog Atlantico and thank you!